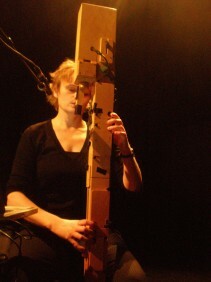 Natasha Anderson is a musician, composer and installation artist from Melbourne, Australia currently living in Berlin. She makes electro-acoustic, audiovisual and musique concrète works in a variety of forms – from live performance to commissioned scores to gallery installations. A primary interest is the creation of idiosyncratic sounds that generate tension through their precise formal placement and uncanny nature. Her works variously explore the abject, intense psychoacoustic experiences and the whiplash juxtaposition of extremes. Recent and upcoming works include a large ensemble and electronics work for Ensemble Phoenix Basel, an audiovisual installation exhibited at NCCA, Darwin (with her collaborative duo STRAY), a solo commission for percussionist Vanessa Tomlinson and a quartet composed for Scott Tinkler (trumpet), Erkki Veltheim (violin), Anthony Pateras (electronics) and herself. Other commissions include those from the Bionic Ear Institute — to write a work for people with cochlear implants — and Judith Hamann (Golden Fur) for a solo cello and electronics piece. As a member of the quintet Thymolphthalein, formed for the 2009 Südwestrundfunk New Jazz Meeting in Baden Baden, she has performed at festivals such as Musique Action, Music Unlimited 24, the Melbourne International Jazz Festival, Alternativa Festival, Next Music Festival, Festival Meteo and the Total Music Meeting. As a soloist she has played at such venues and festivals as the Musique Action Festival, the Festival de Musiques Innovatrices, Musée d'Art Moderne et Contemporain, Gdansk Centre for Contemporary Art and Auckland Art Gallery. In Australia she has performed at most major festivals including The Melbourne International Arts Festival and Liquid Architecture.